A fabulous gem with a murderous spirit attached to it! Siciliano is back with more blending of various authors! Siciliano’s chosen author for this volume is Wilke Collins. The book is presented as a kind of sequel to Collins’ novel The Moonstone. The accursed jewel has passed down to a lady called Alice Bromley. Once part of an Indian temple statue, the stone had been stolen many years ago. Charles Bromley, husband to Alice comes to 221B citing danger to his wife and asking Holmes for help. As usual with Sam Siciliano, Doctor Henry Vernier takes Watson’s place in the adventure. 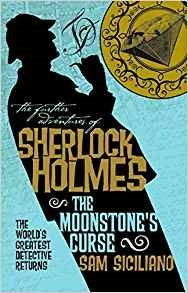 In fact, Holmes dismisses Watson’s writings as “mostly fiction.” Vernier is Holmes’ cousin and Vernier’s wife, lady Doctor Michelle Doudet Vernier plays her part as well. The book uses subtle hints and clues carefully, revealing just enough to tantalize the reader and keep him or her hooked. A steady pace helps, rather than hinders the plot, making time to fully develop all of the characters. There is one thing that maybe I missed, but I don’t think so. In the final reveal, it seems some of those involved are never clearly identified. I guess I could have missed something, but going back and rereading the last several chapters still left me unsatisfied. If you can get beyond the fact that Watson doesn’t appear in the story as narrator, or indeed at all, the story isn’t all that bad. It is just a bit lose in the end. The mystery is solved, some crooked people identified, but not all of them I believe.